Good evening, my sweet friends. So much to write about this evening. So, I'll just get right to it. A great, BIG thank you for the overwhelming response by you all to The Princess & the Peddler. It warms my heart to know that we have so many kindred spirits out there. I had said that I would include in this newsletter the instructions on how to age your fabric for that prim look. The link below has a good article that should help you. If you do still have questions, shoot me an email and I'll see if I can help you. I do like me some aged linen for my projects. I've found a couple new suppliers that I think you're really going to like. AND then, the Nashville Market is just around the corner. This will be my first year to attend. I am so excited to meet the designers and see what new patterns they have created for 2017. I have always wanted to do punch needle but just never had the time to learn it. But I have to believe that many of you do love punch needle. So, I'm going to carry some patterns and we'll see how it goes. Let me know if you like the patterns that I've chosen. I'll be learning with you on this punch needle stuff. AND I think this should be fun! I would love to see your finished projects. Feel free to post them on the Princess's FB page . You'll need to include your name, name of the design and the designer. I'm betting we all would love to see what our sisters/brothers have completed. I have a couple stitches in mind that I will post in the AM, just to get the ball rolling. What more could there possibly be, you ask? For subscribing to the newsletter, I am offering a 20% discount on your entire order for ONE WEEK ONLY. Soooo, this is good until 1/24/17. All you have to do is enter this CODE when you checkout: PP117. Pretty simple, right? (I told you there would be special discounts available to those who signed up for the newsletter. 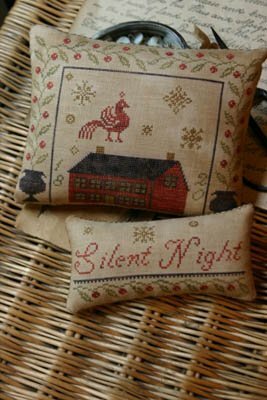 :-) ) AND I am bringing in this GREAT Silent Night pin keep and ornament by Stacy Nash. It won't be here by the 24th, when the coupon ends. BUT if you order BEFORE the 24th, I will honor the discount. (It should be here around the 27th). I just love this pattern. This will retail at $12.00 for those who don't use the coupon. With the coupon, it will only be $9.60. You can find this under the 'What's New' and 'ALL' categories. Hope you like it as much as I do.